The chaos of today is not going anywhere. Hoping you can hold on until it stops is a futile coping technique according to corporate trainer and keynote speaker, Petris Lapis. 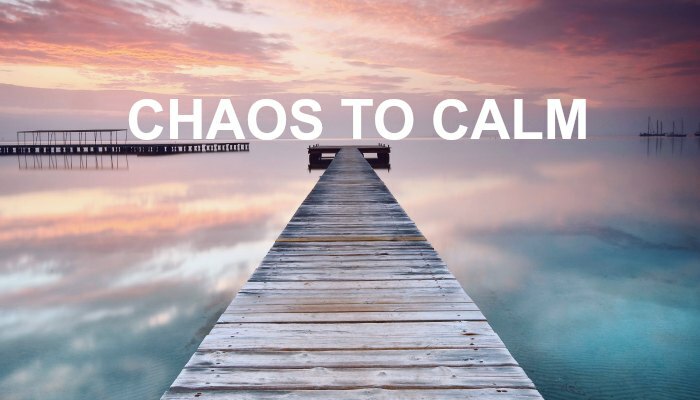 Fortunately there are things you can do to move from the chief of chaos to the custodian of calm despite the daily turmoil you might find yourself immersed in. Work (and life) has never been more hectic or messy and like a blender with the lid off, the more you crank it up, the messier it gets. You throw more and more balls in the air and work longer and longer hours in a vain attempt to keep everything afloat. You don’t dare take your eyes off the balls and while juggling you become more and more disconnected from yourself and others, until you stop one day and wonder what happened to your health, your relationships and the love you used to have for your job. As mentioned above, the chaos is not going anywhere. Holding on until it stops is a futile coping technique. But there are things you can do despite the daily situation you find yourself in. Productivity was a relevant concept at the start of the Industrial Revolution when we were trying to produce more identical products out of a manufacturing line in a shorter amount of time. Surely that is no longer our goal? Will working more hours, producing more low-quality emails, or making more phone even though they tick off KPI for the month, really result in the outcomes we should be chasing? Shouldn’t our goals now be related to the quality of the conversations we have and the connections we make, rather than the quantity? Shouldn’t we now be talking about ‘strategy’ rather than ‘productivity’? 1. Set your intention for the day with a focus on what you want to achieve, rather than spend the day mindlessly reacting. Your attention is driven by your intention. You can set it yourself or you can let others and ‘urgency’ decide where your attention and energy will be directed. 3. Start ditching goals you have ignored for ages, activities that are a waste of time and people who drain you. Stop the unhelpful stuff and turn your attention to the people and things that really matter and will give you the greatest impact. Hanging onto all the rest just wastes time and energy (but provides a fantastic breeding ground for guilt). One of the reasons it is so difficult to cope with chaos in the workplace is because of the way our brains evolved. They are hardwired to notice changes in your environment. Thousands of years ago, these sudden changes could be a signal warning that we might be in danger of becoming breakfast for a sabre tooth tiger. What used to keep us safe, now drives us bonkers. We are easily distracted by emails, text messages, conversations in the adjacent work station, ringing phones and the beeping of the printer that has run out of paper and which everyone else is managing to ignore. Unfortunately our brains are so hardwired to look for change in our environment that we are distracted by almost everything and anything that changes from one moment to the next. Fortunately, overcoming our brain’s wiring is a matter of choosing to behave differently. You can do simple things to help yourself, such as put your mobile phone in a drawer, turn off the email alert or close your door. If you desperately need to be away from distractions, take yourself to a coffee shop for a bit and divert your phone. Find ways to work with your brain. It is like the person you have been in a long-term relationship with; there is no chance of changing how it behaves, so it is best to change how you behave. Your brain comes with its own internal reward drug known as dopamine. When you finish a job, the high you get is due to dopamine. Each time you take a step towards a goal or cross something off your ‘to do’ list, dopamine goes wham and gives you a nice little feel good boost. Dopamine not only feels good, it is also addictive. Do you feel like you have to constantly check emails, tweets, facebook or text messages? Do you feel lost if you are without your phone? Dopamine is the reason. Each time we check and there is a message we like, we get a hit of dopamine as a reward. This is why we are constantly compelled to search for messages in the same way a gambling addict is constantly compelled to keep trying for the lucky bet. No wonder it is so challenging to break our phone, email and social media habits. The best way to deal with the way our brain behaves is to remove the distractions by shutting down the alerts, putting our phone in another room or any other cunning strategy you can come up with. You can harness the power of dopamine for good by giving yourself a creative environment to work in, breaking big projects down into smaller chunks you can tick off, playing motivating music or going for a walk in your lunch break. Make use of the ‘reward circuitry’ in your brain to get you fired up and in control of your working day. Each time you tick off a task on your list, your brain rewards you with a dopamine boost to get you excited and motivated for the next one. Hip hooray for putting other people first and its nobility as an idea. Yes, it is important for us to provide service to our community (work, friends, family etc), but the best way to do that is sleep well, eat well and look after your physical and mental wellbeing. Only then do you have what it takes to be switched on to making decisions, being present in conversations and motivated to take action. The simple truth is that working harder at working hard isn’t helping to take away the chaos and the panic that has become habitual in our working life. We need to do something else. So, when the smelly stuff is hitting the fan in your workplace and you don’t know how you are going to get to the end of the day, try this …. Seriously stop what you’re doing, the rushing, the internal chatter about the serious situation you are in and breathe … several times in and out. Pause and take stock of what is really going on. Get out of panic and back into control. Do it like a pro. Act as if you were in the emergency department of a hospital. What needs your attention immediately and what can wait. Work out what is serious and what is a sniffle that can be sent home. Outsource what you can and tackle the stuff that really needs tackling. Calmly, purposefully and in the direction of your choosing take action. As an army officer once said to me, ‘Leaders don’t run as it panics the troops’. When you have done these three things, do them again … and again and again until they have become habitual. At that point, you will have moved from the chief of chaos to the custodian of calm. Petris Lapis is passionate about helping people live better lives, fulfill their potential and achieve success. She is all about integrating evidence-based mindfulness practices into organisations to enhance productivity, reduce stress and create more peaceful and creative work environments. Petris is a dedicated and experienced mindfulness practitioner and has successfully integrated mindfulness into both her professional and personal life. If you would like to know more about Petris Lapis' keynote speaking or corporate training click here to submit your enquiry, or call us directly on 1300 55 64 69.